What is the Keto Egg Fast Diet? Have you heard about the egg diet weight loss fast? 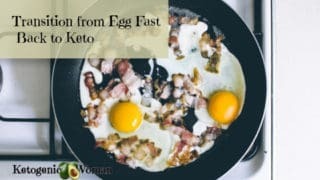 This is the first one of a few articles where I will share my experience and recipes for the Keto egg fast diet. One of the frustrating things that has happened to me is that my weight doing keto and low carb has just basically been stalled no matter what ratios I have tried. Maybe it’s my age (mid 50’s), maybe it’s my activity level which is now so much less than before my knee injury. Whatever the reason, I have been frustrated by slow and even non-existent weight loss. Enter the low carb keto egg fast! 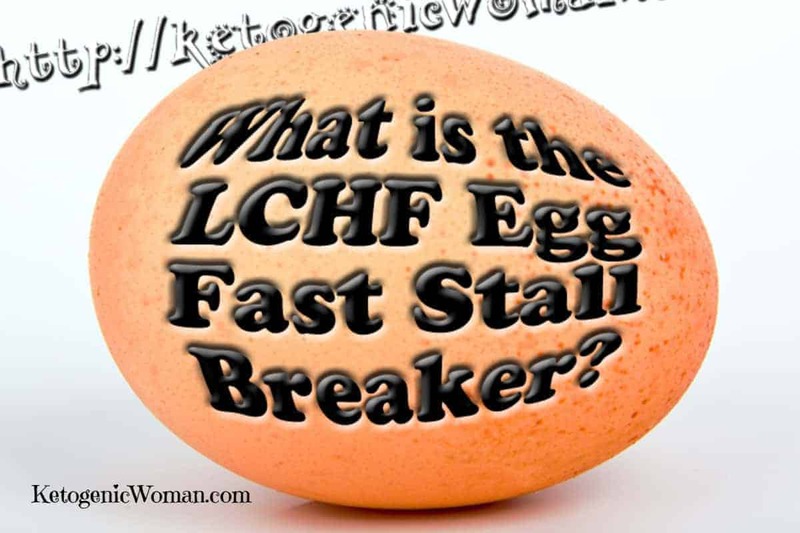 Depending on where you look, it is also called Egg Fest or Egg Diet Weight Loss Fast, also called the LCHF Egg Fast Stall Breaker! Now it was that last name that really caught my attention. What are the Keto Egg Fast Rules? Here are the original egg fast rules as designed by Jimmy Moore for his own Egg Fest which he apparently followed for 30 days and lost 27 pounds in that 30 days. 1. Must eat eggs as the primary source of fat and protein. 2. 1 tablespoon of butter used per egg consumed. 3. I must eat an egg no later than 30 minutes after waking. 4. The egg meals ideally should be eaten every 3 hours, but not more than every 5 hours. 5. I will follow this schedule even if I’m not hungry, however I’ll only have 1 egg when that happens. 7. A minimum of a half-dozen eggs must be consumed daily. 10. Diet soda will be allowed up to 3 cans daily with a goal of 1 or less. Ok, so now you have HIS rules that he made for himself. Here is how I reworked the egg fast for ME, still in keeping with the original plan. I have expanded on these rules after the image. Eggs are still the primary source of fat and protein. 1 tablespoon of the following fats PER EACH EGG consumed (in order of preference): Butter (grass-fed is nice but not necessary) , Organic Extra Virgin Coconut Oil , sugar-free mayonnaise (any type that is zero carb). I limit my mayo to 2 tbsp daily and try to do mostly butter and coconut oil. In the morning I make my EFC (Keto Egg fast coffee). I use 16 oz coffee, 1 teaspoon So Nourished sweetener , 1 tbsp coconut oil and 1 tbsp butter. I prefer to blend this in my blender. It looks and tastes like a frothy latte. This means that I omit 2 tbsp fat later in the day with some of my eggs but feel free to throw 2 eggs into that blender! I only eat if I am hungry. Up to 1 oz of cheese per egg consumed (real cheese only). I find that I can only eat 4 ounces cheese max for the day or even this egg fast stalls me! Diet soda? No thanks! I figure my morning coffee is my version of this rule. However, we are finally seeing the Zevia Natural Soda here in Canada so I may have one of those now and then if I need something. Up to 3 servings daily of sugar free sweeteners. So there you have it, my very own custom tailored version of the egg diet weight loss fast! In my next post I will share my own results of breaking my Keto stall. Keep scrolling down to get some recipes! 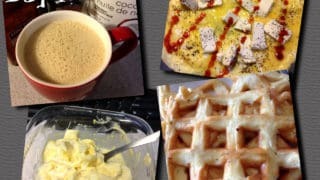 What Do You Eat on the Keto Egg Fast Diet? Recipe to make your own mayo! 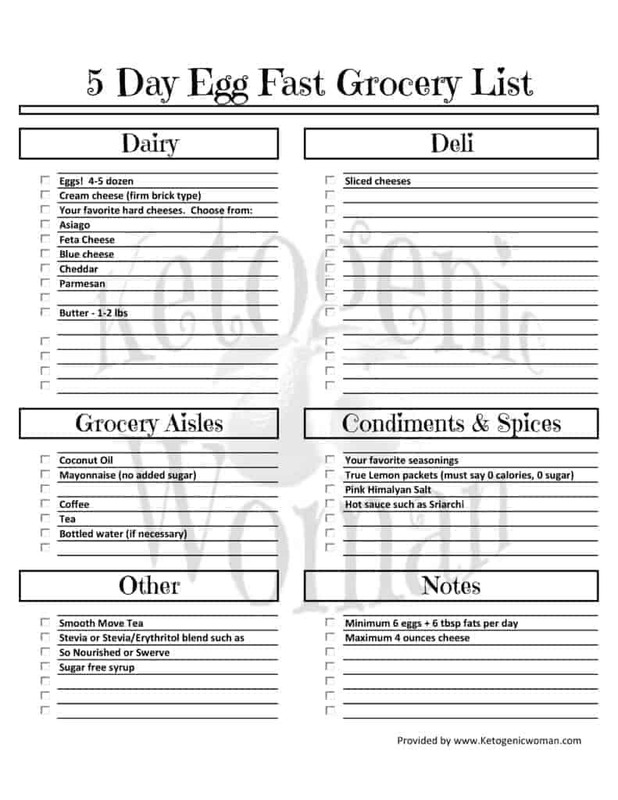 When you have done the Egg Fast and want to return to regular Keto or Low Carb, here are the Egg Fast Transition instructions. everything LCHF Egg Fast! If you are serious and can follow the directions, come and join us in the fun! 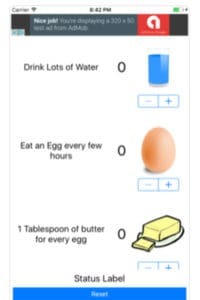 Egg Fast Tracker App: This is a free app for Android and iPhone that helps you keep track of your Egg to Fats ratios, plus your water and cheese consumption. Install the Android Egg Fast Tracker app here. Install the iPhone/iPad version of the egg fast tracker here. These are my favorite egg fast cooking utensils! Tagged egg fast menu, egg fasting, egg only diet, how to break stall on LCHF, LCHF recipes, low carb egg fast. Bookmark the permalink. 179 Responses to What is The Keto Egg Diet Weight Loss Fast? 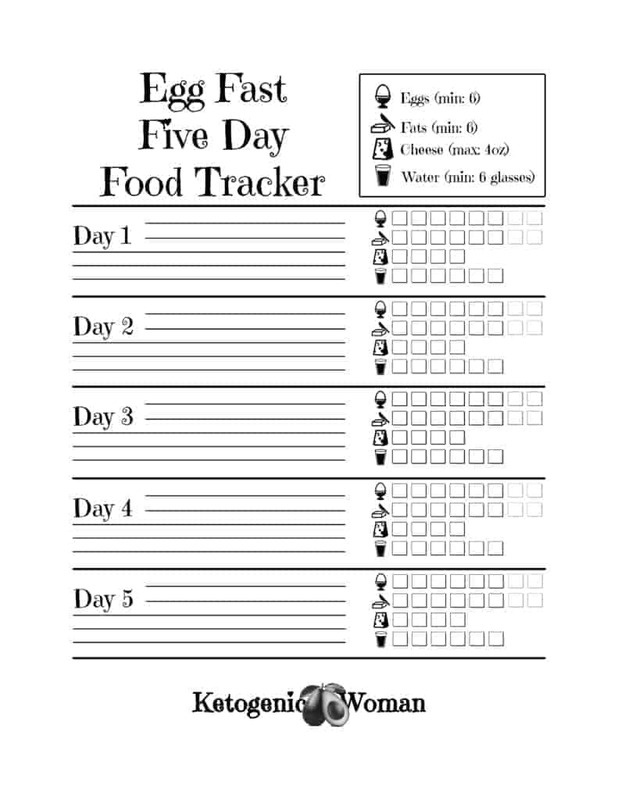 Hi, I’m interested to know if the Egg Fast would be appropriate to start a keto plan? I need a bare bones plan without needing to cook a variety of meals. I’m so busy that I’d rather not have to figure out a keto meal plan until I’m mentally prepared to put in the work. But I need to get going with something! I have no trouble fasting for 16 hours at a time…. Yeah, I think it’s a great way to kick start keto, just be prepared for some keto flu and read this article to prepare you for it. so if i do IF it is ok not to follow this? and also this? so it means i can make my own schedule? and as long as that i eat min of 6 eggs? its that right? sorry I’m just so confused and i really want to do the egg fast diet.thank you. It really is ok if you make some of your own decisions on this! What you are quoting there is simply the original Egg Fast creator’s (Jimmy Moore) personal rules around this. It really is fine to set your own schedule and do IF. Go for it! Why allow for diet soda as part of the program? I was very surprised to see that. You would be hard pressed to find one that doesn’t have a carcinogenic ingredient as a sweetener. I totally agree with you! The person who created this Egg Fast (Jimmy Moore) apparently had a diet soda issue and so 3 a day represented a major cutback for him. Just don’t have any! Can i get all 6 tbsp of fat kn the morning with my coffee and just focus on my hard boiled eggs w/salt the rest of the day. In theory yes! My concern would be tummy issues from consuming that much fat in one sitting. However if you are already fat adapted then you could probably handle it. Can you alternative egg fast with the ground beef and butter fast each day and still have the same results? Well I’ve been stuck for a while and even slipped up a couple of pounds so thought I’d give this a go…..dropped 6 pounds following this plan in 3 days — Pretty Happy with the results. Plan on taking 4 days off and eating a regular LCHF diet and then do this again for 3 days. I do intermittent fasting and count calories. The calories for this egg fast is through the roof for me. Do you think i would still lose weight? The minimum egg fast plan is 6 eggs + 6 fats which equals approximately 1100 calories. I don’t see that as through the roof, I think it is barely survival mode for the body! Is it 6 eggs 6 T of fats ( kerrygold butter) AND 6 oz of cheese? The cheese is optional and in the EF facebook group many people report having better results limiting their cheese to 1-2 ounces a day max and having 7-8 eggs with 7-8 fats. The calories won’t matter because your body will burn its own fat because of the very low carb amount. Check out Dr. Ken Berry on YouTube about calories. I would just keep my same eating schedule. let us know how you do! I am so confused. Nobody says anything about calories. Do you not count calories at all? Also you have to have 1tbs of fat per egg consumed, by do you have to an egg per 1tbs of fat? Meaning can I have more fat than eggs? Or equal no matter what? On Keto we generally don’t count calories unless there is an underlying reason to do so. This is not really a diet in that sense, it’s a way of breaking through a Keto or low carb stall. It’s a 1 to 1 ratio with the eggs and fat, so yes it’s always equal. Good luck! Does anyone know how the egg diet affects your cholesterol? I am nervous enough about that the ketogenic diet is doing, and I have my blood work done in November. You really want to research this for your own situation. My cholesterol is fantastic and I have been doing low carb and keto with egg fasts for years. But I am not a doctor and I can’t give medical advice. The keto Diet was recommended to me by my gastrologist. I chose to do low carb because of my high cholesterol. It improved after only two months on it. I tried eating extra oatmeal in years past, but it didn’t help at all. I had always followed the low fat diet becuase I was a 14 yo learning to cook when my father, age 42, had a triple bypass in 1982. Last May, my 12 yo son was diagnosed as insulin resistant. His doctor said the low carb diet would be great for him. He lost 25 lbs in two months. You can do whatever you like! It’s not part of the egg fast so why not just follow it as is for a few days and then go back to adding in your favorite items. Hello, I made the waffles. turned out great, I put cinnamon and truvia on them…. Someone asked if cinnamon was allowed… I didnt even think of that. Is it? and what seasons if any are allowed? Spices are allowed but just be reasonable and use just enough. They do have a surprising number of carbs in them. Glad you like the waffles! I followed Dukan LCLF diet and lost 32 pounds. Then I stalled and lost faith. I am using egg fast to de-carb this week. Today was the first day. Other than BPC in the morning can you drink unsweetened tea with stevia?? Can you have more than 1 BPC a day?? Fat is equal to each egg but limit of 6 tablespoons a day or unlimited?? I have read several post and just want to clarify. Thank you for your help. Sorry have one more question. Have needed miralax and cetrucil each day. Can I continue that? I would use something with less sugar personally. I kind of like Smooth Move tea. Also using more coconut oil than butter does it for some because coconut oil is a natural laxative. The fat limit is tied to the number of eggs. If you consume 10 eggs than you consume 10 tbsp fats. The sweetener limit is 3 per day. You said Dukan LCHF. Does Dukan have a High fat version now? The last time I looked at it they were very low carb, very low fat. I’d be interested to know! Hello!! Amazing post, very detailed and well laid out! I’ve hit a plateau and then binged (bad bad bad, I know!) I plan on starting the egg diet tomorrow to adapt to no carbs & no sugar again (and hopefully beat my awful sugar addiction). I’m just curious though, I’ve been having a “coffee shake” for breakfast in the morning – cold coffee, cashew milk & 1 scoop of kaizen natural protein powder (1g carbs no fat no sugar), is it acceptable to add my 1 scoop to BPC? No, none of this is part of this egg fast. Of course, you can do whatever you like, but that is not this egg fast, that is some other diet. 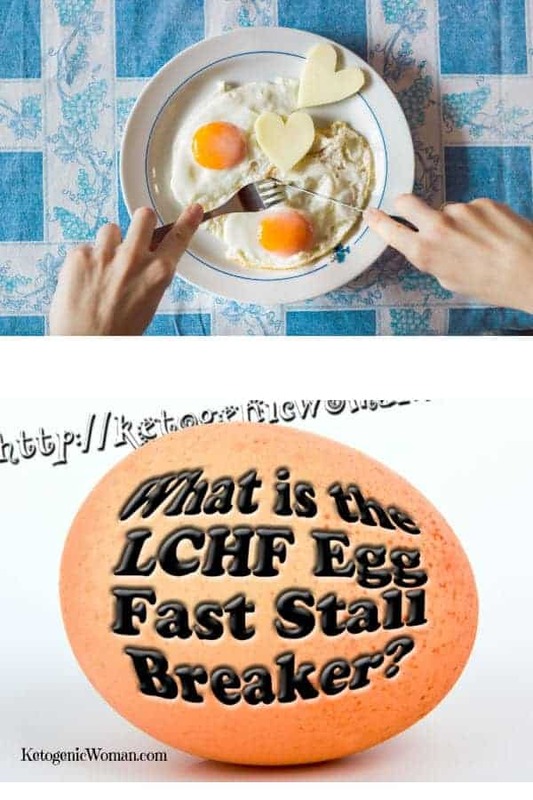 🙂 Check out the Egg Fast FAQ! Can I use lemon, lime, or ginger in my water? That is entirely up to you and your level of tolerance to caffeine. Myself, I am sensitive to it so I can only have 2 coffees in the morning and herbal tea the rest of the day. Green tea is awesome and I do drink decaf green tea every day. Right now I am doing regular keto but the egg fast helped me to lose my cream habit and go dairy free. Since writing this article, I have lost another 40 pounds in addition, so I am happy with that! You will have to decide that for yourself. Olive oil is not the best oil for cooking, coconut oil is better because it has a higher smoking point. The admins in the egg fast group don’t recommend it. Good luck! Why limit the mayo to less than 2 Tbls a day? Does this also apply to your own homemade? There is no limit like that on mayo. If you eat 12 eggs you also eat 12 tbsp fat and that can be either mayo, butter, or coconut oil. What about raw cocoa butter as a fat in bpc? Can you eat gelatin and bone broth on the egg fast diet. I find both help me with joint pain, especially in my knees. I am working on keto diet bit find my colon is plugging up with the fat intake. Nice to find a fellow-Canadian Keto-er! Hi! Oh how I WISH we had it here! I live very close to the border and so I buy my Kerrygold when I make runs to the Costco in Bellingham. Thanks for visiting my site! Is 10 eggs the maximum you can eat in one day? And do you count calories? . There is no counting calories. Two important things to count are #eggs/#fats, the ratio of 1 egg to 1 tbsp fat is important. The second thing is to not go over 4 ounces of cheese for most people. And there is one more thing, eat until satisfied but not stuffed. Good luck! Have you ever tried egg drop soup on the egg diet when you have the egg sickness? I was just wondering if it would be acceptable in general. Without the starch or soy sauce. thanks so much. Today is my first day on egg diet. I was going to start out on ketosis diet but really had no idea how to begin. Egg Sickness? Do you mean Keto Flu? At any rate, one of the members over in the egg fast group came up with an EF compliant egg drop soup. Boil 2 cups water with 2 tbsp butter, add lots of sea salt and pepper. When it gets to a rolling boil stir in 2 beaten eggs. Another member likes to add a couple tbsp cheese to that. It’s quite yummy, hope you try it! Im starting the egg fast today with lots of hope as i need to lose some kgs by next week. Gained some kilos post pregnancy but luckily healthy eating shed some of them without any diet and exercise. Now im stalled n want lose fat on precise areas. Can we need exercise during the egg fast?n how long a session n how many? Will i feel tired, dizzy n weak?? Exercise will lead to water, muscle or fat loss? Thank you. You are probably better off to find a low carb group on facebook where people exercise a lot. I just don’t have a lot of experience in trying to spot reduce specific areas, I’m not sure it can even be done. If you are not already keto and fat adapted, then yes you will feel tired, dizzy and weak while you detox from carbs. Hope you find your answers! Kindly add me to your facebook group… I have already sent a request.. Thank you. 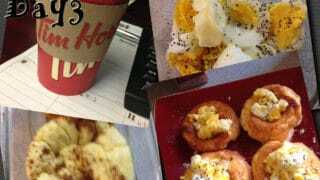 I have also sent a request to join the egg fast stall breaker diet. I have been doing LCHF for 18 years. I have stalled in the last year and gained about 30 lbs. About to turn 50 and exercise level has dropped. I plan on dropping the weight and getting back on my exercise routine. Looking forward to gaining info and chatting on the FB page! Can you please add me to the FB page. Hi there. I have been off coffee for about 3 months now. I have replaced it with either hot water and lemon or Caf-lib coffee alternative. Are either of those options acceptable? I don’t know what that coffee alternative is, but the idea of the egg fast is complete elimination. Of course, you are an adult and can do what you like but I encourage people to wipe the slate clean and try the egg fast as is, in it’s simplest form for a few days to get best results. Good luck! What do you think about intermittent fasting and the egg fast? I seem to perform at work at my best if I only have 2 cups of BPC, then wait to eat when I get home from work. I’ve been keto for about a month, but I need a kickstart. My personal opinion is to work the egg fast into whatever schedule works for you and if you are not hungry don’t eat. So if IF works for you then do it. What weight are you losing on egg fast. I lost 4 pounds in one day without a bowl movement. What 4 pounds did I lose? I can’t find any info on what is actually lost. It depends on what you were doing before the egg fast. If you were doing the Standard American Diet (SAD) OR if you had a carb binge leading up to the Egg Fast, then those 4 pounds are likely water. But if you were already following LCHF/Keto and were using the Egg Fast as intended to break through a stubborn weight loss plateau, then there should be some fat loss there. People should always take their measurements before starting the Egg Fast. Hope you keep it going for a few days then transition very slowly back to LCHF. Love your website, very informative please keep up the wonderful work! Would it be possible to join your FB group? Hi there! Can you give it one more try? Here is the link, I will watch for your name! Thank you for posting this I will be looking for the facebook page. I went of keto woe due to a number of things for about a month. Ended up with aches and pans and fogy head again so decided to restart and found egg fast. This is my second day and so far no keto flu. (say prayers please.) and I’ve lost 2 pounds thank you so much. One note I don’t really eat much salt so I have been adding some to my BPC it has gotten rid of the bitter taste so no sweetner needed and my leg cramps have disappeared. Coffee is completely optional, you can drink green tea or even just water. Whole real eggs are not optional. Egg beaters are not only not even real food, they don’t have the correct fat to protein ratio for the egg fast. There is no substitute for whole eggs. For the fat with eggs, could I eat avocado instead of cheese or cream cheese? If you want to follow the egg fast exactly to get best results, then stick to eggs and butter. Cheese is also NOT a substitute for the fat on the egg fast. Here is the link to the Egg Fast FAQ. Good luck! I just looked and I did not see your name on the waiting list, please request membership again. Also there are a few egg fast groups so maybe you requested another one? Please here is my name. I have requested to join the egg fast Facebook group without response. Halima Shade shaba l appreciate all your helpful tips and advice concerning sticking to this lifestyle. I begin my journey on Monday March 14th. Looking forward to this. Thank you. I did not see your name in the list waiting, please try again and I will watch for you. Hi there, wondering whether I could have ricotta cheese 1tbsp with my morning eggs? Or if I am having cheese it has to be cheese cheese? For the Egg fast is it supposed to be regular hard cheese or cream cheese, no ricotta. Good luck! Thank you. I use hwc in my coffee and wonder why on lchf diet I could not lose wt. now going to buy the Irish butter and coconut oil/ Nutiva and do that. Hope I begin to lose more weight. Thank you for your recipes & meal plans! I requested to join the Egg Fast Facebook group a couple times and haven’t been added 🙁 I’ve recently joined some Keto groups, but I am not new to this WOE. I’ve hit a plateau for a couple months, but I’m feeling a little encouraged again. Thank You!!!! Hello everyone! I did the egg fast last Monday and lost 10 lbs within Five days. Today is Day 5. It really works! Wow, that’s awesome! I think this is where I’m supposed to say ‘Results not typical’ in fine print of course! But way to go! Do u watch calories on the egg fast to? aww, thank you for reading my blog! I drink flavored water all day but it has artificial sweeteners so stop that? What about my bpc? No hwc or sweetner? That’s correct. There is no HWC on the egg fast (a known staller for many people) and up to 3 servings of sweetener a day. So you’ll have to plan out how to use those 3 servings. Remember it’s only a few days! BTW, try your BPC like this: 16 oz coffee, 1 tbsp butter, 1 tbsp coconut oil, a touch of sweetener (I use 1/2 packet) and some cinnamon. Blend it up until frothy. Delicious! Can you clarify what HWC is?? I see so many abbreviations I can’t keep up, lol. ha, you beat me to it! Yes, so many abbreviations! Day 1 and I put on weight, can you eat too much? I suppose that is possible. There’s so many factors such as what you ate the day before, how close to normal weight you are, hormones, medications. Is cream cheese considered cheese or can it be a fat? For the purposes of the Egg Fast, cream cheese counts as a cheese and not a fat. Good luck! By the way, I tried the vinegar idea and it worked!!! I was so happy! I still have the headache and absolutely NO energy but the yukky, burning tummy is gone!!! YAY!!! Glad you are feeling better! Keep it clean and you should do fine! Sorry I mean to say can I use olive oil instead of coconut oil? Don’t use it instead of coconut oil, use it as well as. I really think it’s best for people to not use all one oil. So if you eat 6 eggs in a day, vary your fats by choosing butter, coconut oil and other pure oils. 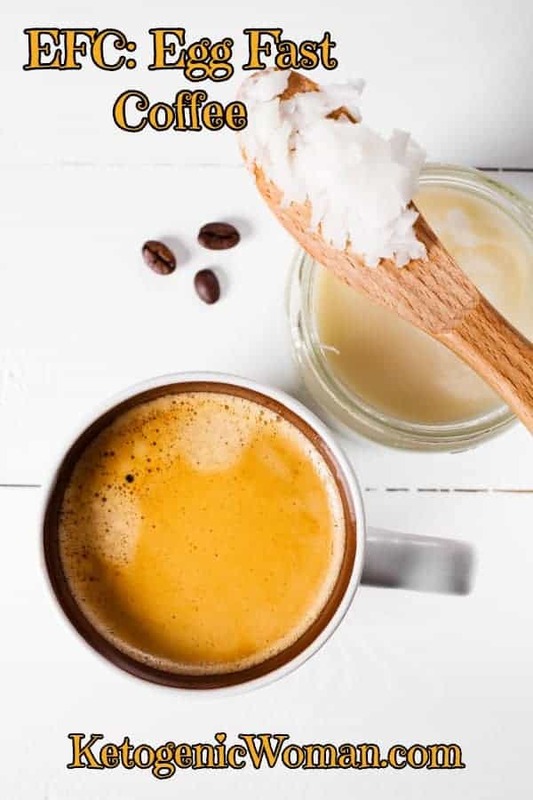 Coconut oil has those wonderful medium chain triglycerides and you don’t want to miss out on those! Can you explain why heavy whipping cream is bad?? I have 2 tbsp in my coffee each morning. And in my tracker is doesn’t have any carbs or sugar. Just wondering why it’s bad? I have been on ketogenic diet for 2 months and lost 20lbs..but i do get stuck sometimes with plateaus. You can do that if you like after the egg fast. It’s only 3-5 days without it. The egg fast works because it eliminates everything except a few very select foods and heavy cream is not one of the allowed foods. You could make the same argument for avocado or rib eye steak. 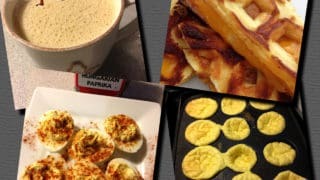 They are not ‘bad’, they are great foods on Keto and they are not on the egg fast. I will say this, HWC seems to be one of those things that people struggle to give up. And I was one of them. And I hear people say over and over again, that giving up HWC allowed them to progress further. Also one thing to know about trackers is that they often will say something has no carbs when it has .5 carbs or less. HWC is not a pure fat like butter or coconut oil. Hope that helps! I am starting LCHF today, I have decided to start with the egg fast, is this OK.
Well it’s certainly ok but you could be in for a good dose of what we call Keto Flu. So keep that in mind if you are feeling very sick on Day 2 or 3! It’s only temporary and you will feel better in a few days. Yes, you can drink green tea. That would be way better than diet soda! I much prefer salted butter in my bullet proof coffee! The salt in the butter enhances the other flavors in the coffee and in my opinion makes it require less stevia/sweeteners. Started egg fast today but am battling find full cream cottage cheese and cream cheese. They all seem to be low fat. Is this a problem? Don’t worry about the cottage cheese because it’s not allowed. No Philedelphia cream cheese in a brick? Cheese is just optional anyways and you should use as little as possible for best results. So I’m sure that a couple ounces of low fat cream cheese won’t hurt if that is all you can get. I don’t think that should have caused a weight gain! But not knowing anything about you and where you are at age, medical, hormone, etc status, I can’t really offer any suggestions. I do know that sometimes plateaus are normal and your body might need to catch up. If it’s been many weeks, then something like the egg fast works due to cleaning up all the extras and the carb creep. No coconut cream, no substitutions of any kind. Honestly I think that is why it works so well. It’s only 3-5 days, we just bite the bullet and do it! I’ll be sticking to the plan for 5 days, excited to see the results! I must fit into a bridesmaid dress two weeks after vacation. On vacation I put on about 5 lbs. I began the egg fast 3 days ago. I have lost 4 lbs! This diet def works to jump start weight loss and get back in ketosis fast! Hello! I have been on Keto for about three weeks now and am just starting the egg fast. Am I allowed to substitute margarine for butter and in regards to some of the recipes I am finding – I see there is a lettuce leaf you can wrap the omelette in, add mayo etc. I didn’t think on this diet we are allowed anything but eggs, butter and cheese. Please let me know if we are!!! Question 2. If I am wanting to do this straight by the book – ie: to lose as much weight as possible. Am I only allowed one cup of coffee a day. And if I am allowed more than one can I make it bulletproof or just black. Question 3 I use vega sport sustain in my water. My trainer has researched this electrolyte and commented that he can’t find anything wrong with me taking it for our goals of no added sugar but was worried that because it is sweet it may tell my brain to release insulin? You can have more coffee if you want, some people think coffee (even black) slows down weight loss. I haven’t got there yet! You can make it bullet proof as long as you only use butter, coconut oil and eggs in it. No HWC! Get rid of that vega sport drink, sorry but it may be sugar free but yes your trainer is correct about the constant ‘sweet’ stimulation. Also other sketchy chemicals in it. Good luck! Some foods are listed sugar free and have no carbs but are mostly high fructose corn syrup, take for instance sugar free cofee creamer. 1st ingredient water, 2nd ingredient high fructose corn syrup. But it’s sugar free. Absolutely! This is why it is so important to read the labels. I am on day 3 of the egg fast. Experiencing terrible indigestion. I don’t know if it’s all that butter or maybe the coffee. Any thoughts? It’s part of the detox for some of us. I had it and I already was LCHF before that. Some people use baking soda to help it. I used sugar free Tums. Hope you feel better soon . Usually apple cider vinegar KILLS my reflux in seconds. Yes, I’ve heard that works for a lot of people. I need to get over my fear of it tasting bad and try that. Do you dilute it? Most times this works for me. yes you dilute it. Its especially helpful just before meals as it helps with food digestion to and weight. What is often called by doctors “too much stomach acid” is LOW stomach acid, meaning not enough to digest food in the stomach. Those for whom 1 tsp of vinegar in 2 oz (2 tablespoons) of water fixes the problem likely have low stomach acid; they should never use antacids! A home test for low stomach acid is that given above. If the tester’s problem gets worse after ingesting a little acid (vinegar), he/she may truly have too much stomach acid. Doctors often suggest antacids without testing, and commercials abound. But using antacids can give users serious health problems (because we can’t digest and use food nutrients unless we actually digest them). This is an excellent reply. I intend going on the Egg fast very soon, just clearing the old fridge. You are correct about older people not having enough stomach acid. I have no gall bladder (emerg surgery Dec ’12) and since then have had horrible problems with weight and have hiatus hernia, I have tried HCL but found it created more problems. Its a constant balancing act between Omeprazole and ant acids. Sometimes in bed I sit up quickly as my throat burns and want to sick. The more low carb I go the problem gets worse to. I get up extremely early for work (3:30 a.m.) and eat lchf. I also do intermittent fasting daily. I don’t eat until around 1 pm. Would that be a problem while doing an egg fast? No, you can just work the minimum 6 eggs/6 fats into whatever your schedule is. Good luck! What happens if you’re not see weight loss on the Egg Fast Diet? I’m at day three and nothing. Thoughts? There are so many things that can affect this and it doesn’t work for 100% of people who try it. Things like medications, age, activity level, hormones, illnesses, how many pounds away from normal. And if people are following low fat or low calorie diets and try the egg fast, they will often not lose either. Sorry I can’t say why you didn’t lose but those are a few ideas. I followed LC since Feb 1, lost 26 pounds almost easily, then had a severe abdominal flu May 25th…have not lost since–9 weeks!! so today is the first day of the egg fast. Partly I am stuck due to ongoing long term pain(DrJ. Fung claims “non-diet” issues keep us from losing) AND I am at my former long time weight, so my body fights going lower. [Notice I separate” body” from “mind”, as I AM doing LC strictly..but my body is like a bratty kid!!! I goofed already and had HWC in my 2 coffees..so am starting over tomorrow. Will try seeing if I can tolerate the BPC oil & butter version..if not I’ll just do tea. MCT oil is great, but coconut flavored coffee?ugh. I also did a 3 egg scramble with butter on top,3 tbl of shredded cheese was great and coconut oil in the fry pan.. ( I use measuring spoons for everything, easy to measure shredded cheese that way. i love string cheese, and keep a 24 pack on hand all the time. I tried using a tbl of mayo and dipping my string cheese into that, along with HB egg… I am certain I will be sick of them in 5 days..but as a stall breaker…I’m IN! Refined will not taste like coconut. Unrefined will have a little coconut flavor. Unrefined/Virgin us better for you. I use unrefined Try it once. I have turned so many people on to bulletproof who have said “ew, coconut ok and butter? !” Who have thanked me after! It’s not for everyone but you will more likely be surprised at how yum it is. Be sure your grassfed butter is unsalted. If you like walking then go ahead, but you don’t have to. Thanks for visiting my site! I have stalled on keto, I am not overweight (54 kilos at 1.69m) but I am used to weighing around the 51 kilos. I think the weightgain comes from a combination of over -excercising (running) in the past 2 years and falling off the keto wagon 3 times in the past 6 months. I’d like to try the egg fast (I love eggs :-)) but I am also lactose intolerant. Would I be okay substituting the cheese with goat’s cheese and substituting the butter with coconut oil? I am already used to eating sugarless mayonaise. Oh yes absolutely! In fact, cheese is optional so you don’t have to eat it all. In the egg fast group we have been finding that people do best not having too much cheese, maybe 4 ounces a day max. As for the butter, a lot of lactose intolerant people seem to be able to tolerate Kerrygold. But coconut oil is just fine too. Good luck! question. This seems to be a lot of fat intake when you search nutrients on a daily meal plan of eggs and butter etc. and yet you still lose that weight. ?? Yup! It’s the magic of Keto or LCHF (Low Carb High Fat). It’s not the fat that makes us fat, it’s the carbs. Even so called good ones. Why is the egg fast just considered a fast? When people eat only meat for years? Why can’t a person eat only eggs and an orange for the vitamin C and be fine till we lose 100 pounds? I have no idea! I’m sure one could survive on that just fine. We like to label things for simplicity I think, but at the same time it can complicate things. Thanks for your comment. Yes, you can drink coffee if you like! Enjoy! So, we are allowed nothing else?! No fruits or even veggies? Just eggs, cheese, and butter and water basically? That is correct! It’s a short term fast and completely voluntary! If you are doing LCHF and still losing weight, then no need for the egg fast. Yes! Don’t let that hold you back, you will be fine if you wait the hour. Hi, I’ve been following Keto for a while now. Can I do egg fast every other day for better results? 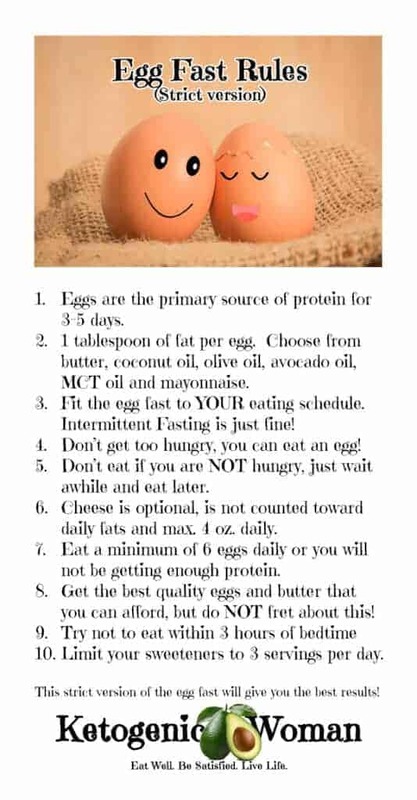 Or can you only benefit from that if doing egg fast for more days in the row? I’m not really sure as I have never done that. A lot of people do 3-4 days on and then 3-4 days transition. Good luck! Thanks a lot, definitely going to try that. Love your blog btw !!! Can I consume sugar free monster drinks while on this fast? Can you have too many eggs? Yes, you could have too many eggs. Eat between 6 and 12 for best results. While technically you could have up to 3 sugar free drinks a day while on the fast, it might be a good time to evaluate all habits. The fast is designed to rid yourself of all but the basics, and get down to the most basic lowest level of low carb high fat eating. There are studies that show that even diet drinks cause us to crave more. Just something to consider. Good luck! Is there other benefits in the egg fast – would i be able to follow it say for 3 days prior to a race for energy? oh gee, not really sure about that one. Some people in the group report good energy, but you would have to already be adapted to using fat as primary source of fuel instead of glucose. So it really depends. Cool. One question…How do you know how much an ounce of cheese is? I can measuree in tablespoons or cups. Grated or whole. Thanks. Hmmm, I use a small kitchen scale. So I’m not sure. Maybe google conversions from tbsp to ounces to see if you can find a conversion program. According to my dietician, an ounce of cheese is a one inch cube or about the size of a domino. That sounds about right Kate! Thanks for the visual! When you get a bar of cheese, say 8oz, try doing a hint of a score down the middle then three across. ..will give you the marks for 8-1oz servings. I am 64 and weigh 120kg and am 171.5cm. I would not try to do the egg fast while away from home, it’s only meant to break a weight loss plateau for people who are already following low carb or LCFH. I would recommend just sticking to basic low carb as best you can while away. Low carb is an excellent way to help with your diabetes. Hi there, I have been Banting for about 3 months now and am loosing cm not kg so have been told to try the egg fast. I have read up what I can, but need to know apart from the required number of eggs etc, and some cheese and butter, is there anything else I can have like veg or apples? I cant find the sugested list of foods permitted. Hi Erica. The egg fast is just that, a fast. It is basically eggs, butter and cheese (no fruits and veg) for 3 to 5 days and meant to break a plateau. Not really meant for ongoing weight loss. If you take a look at this ‘What is the Egg Fast’post, you can see what the parameters are. That is just impossible to say because everyone is different. In the Egg Fast FB group people lose everywhere from 1 pound to 10 pounds during the 3-5 day fast. But remember, this is not a regular way of eating, it’s simply meant as a short term shake up to break your stall when already following a low carb diet. So if you have been the same weight for several weeks or months on LCHF and this causes you to break that stall and lose even just a couple pounds, then it’s a win. QUESTION: regarding the BPC is the coffee a special blend or can most coffee be used? Any type of coffee can be used. Whatever your favorite!